A favorite at the 2011 Inn to Inn Cookie Tour, you don’t have to wait for spring in the mountains – you can enjoy them all the year round! Preheat oven to 350 degrees F. Mix together flour, baking soda and salt with a wire whisk and set aside. Cream butter and sugars together well, scraping sides of bowl as needed. Add eggs, whiskey, Irish Cream flavoring and vanilla and beat on medium speed until light and fluffy. Add flour mixture gradually, blending at low speed just until combined. Carefully mix in chips. Drop by rounded tablespoons onto parchment lined cookie sheet. Bake 14-16 minutes until cookies are slightly browned around the edges. Using a spatula, transfer cookies to a cooking rack. 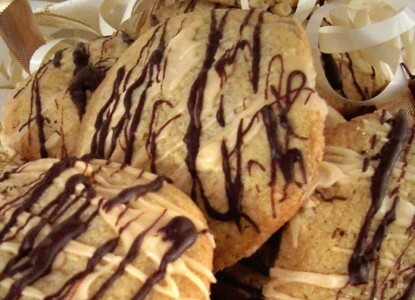 When cool, make a glaze with confectioner’s sugar and Irish Cream liqueur and drizzle over cookies. Allow Irish Cream glaze to harden, then gently melt bittersweet chips in microwave and drizzle melted chocolate in the opposite direction over the cookies. Yield: 3 dozen cookies.